Have you ever needed trimming or booting advice? Perhaps you want to document a particular horse’s transition or present a case study? If so knowing how to take good hoof photos is essential. The “true picture” is easily skewed if care is not taken. I review quite a few hoof and booted hoof photos throughout my work week and they can be generally summed up as, The good, The bad and The ugly! Whether you are a natural hoof care practitioner or a barefoot horse owner or owner/trimmer, a digital camera is an important tool. Hooves are constantly changing and photo documentation can prove to be quite useful. Not only are photos a great tool when seeking advice but they are an excellent way to reflect on your work and progress. 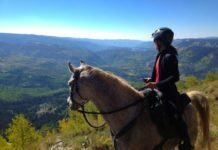 They can reveal subtleties that may have been overlooked, serve as a reminder of how far a horse has truly progressed as well as help refocus overall perspective. 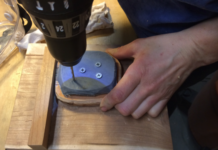 Hoof form, hoof boot selection and hoof boot fit go hand in hand. If you request booting assistance from EasyCare, an EasyCare associate may ask for photos of your horse’s hooves with the boots on and off. The following has been provided by the Pacific Hoof Care practitioners organization and is the perfect way to allow us to best assist you. We may need additional information and not all views shown below, but if you follow these pictorial examples as requested chances are we can access your situation and make accurate recommendations quickly and easily. Below is an excerpt from the PHCP’s training program with details on taking the perfect hoof photos. If you choose to use Macro setting (denoted with a small flower), know that you will need to be within inches of your subject and there is a very small/shallow depth of field, therefore you may end up with blurry pictures. Avoid bright sun, deep shade or partial sun shade (mottled). If you do end up with poor light and have to use a flash, position yourself further away from the hoof and use the zoom lens with flash to minimize flash was. 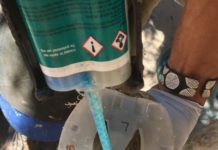 Use a stiff brush to clean ALL mud, dirt, debris from the wall, sole, frog, collateral grooves and heels. Once all the prep work is done, it’s time to take the pictures. Stand the horse on the level ground with “a leg at each corner”. Horse should be loading each hoof equally. Watch out for the stretched out stance and also resting/cocked hind hooves. Take your pictures in sequential order: Full left side, left front lateral, left front dorsal, left front heels, left front solar, left front oblique and then on the left hind. Do the same series on the right side. 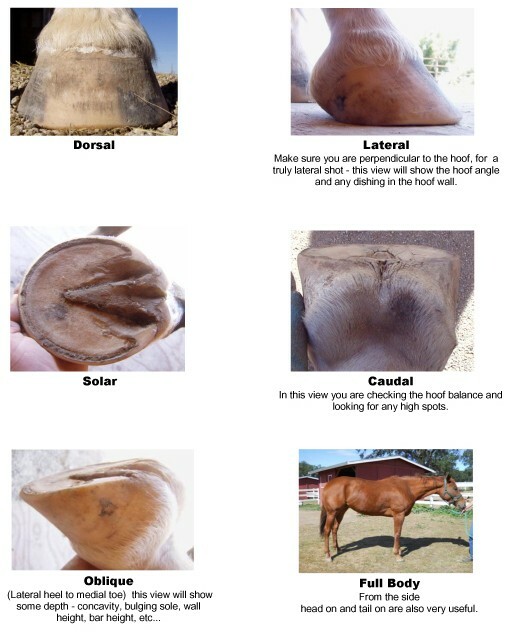 This will help later on, when you are labeling your pictures, to know which hoof you are looking at. If you always shoot in the same order, it will be easier. To take the pictures, position yourself perpendicular to the horse or hoof. For body shots position yourself at the withers/barrel. Stay on the same elevation as the horse; not a point of view above or below. For hoof shots, get your camera down on the ground and perpendicular to the hoof. Heel and solar shots need to be from directly over and square to the heels or sole. Remember to fill your screen with the subject, but please do allow a margin surrounding the subject. Load the photos onto your computer and be sure to label them! We’ve all heard it said that a picture is worth a thousand words. What are your hoof photos saying?